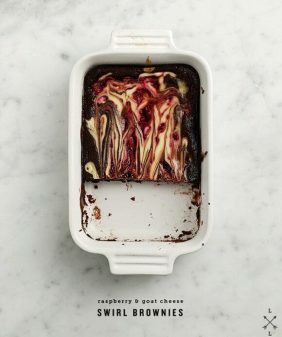 What do you make with leftover polenta and leftover raspberries? Cake, of course! But not just any cake – cake in a skillet. Because skillets = summer. Aside from the little bit of butter I used to grease the pan, this cake is vegan and made with coconut oil. 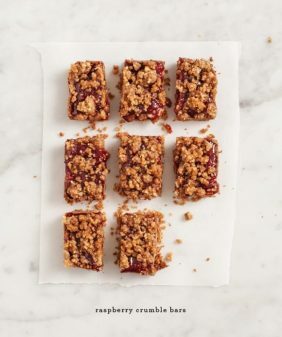 It’s naturally sweetened with maple syrup and, of course, the sweetness that comes from the raspberries. (note: you can grease your pan with coconut oil). It’s a (smaller) version of this peach cake I made last summer – in my 10-inch skillet this cake is just 4 servings, but you can double it if you have a larger skillet and more mouths to feed. I prefer it straight out of the oven with melty ice cream on top. Although, the leftover slices were delicious (sans the ice cream), for breakfast the next morning. Oh, and it goes without saying that you could top this with any fruit you like. In a separate bowl whisk together (by hand) your wet ingredients. Combine both and whisk together until well combined, but don't overmix. Remove hot skillet from the oven, grease it with a little coconut oil or butter (or vegan butter), then pour in the batter. 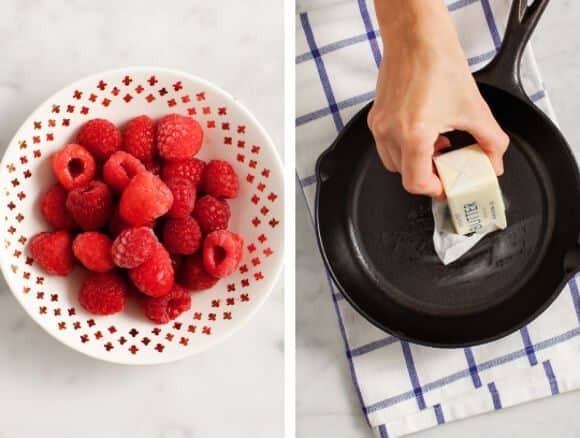 Sprinkle raspberries on top and bake it for approx. 18-25 minutes or until a toothpick comes out clean. Let cool slightly, then serve hot with ice cream. If you use a 12" skillet or larger, you can double the recipe. (Baking time may differ depending on the size of your skillet and the depth of the cake). Make it whole grain: Use whole wheat pastry flour instead of the all purpose flour. Make it gluten free: Use gluten free oat flour, or an all purpose gluten-free baking mix such as Pamela's. This cake looks so, so good! I love raspberries! Love polenta in savory dishes but haven’t gone the sweet rout yet! This cake sounds amazing! I used to date a guy whose mom made amazing pineapple upside down cake in a skillet. Should have made sure to get that recipe. How beautiful is that?! Almost too lovely to eat. Almost. I love the sounds of a cornmeal cake! And it sounds perfectly sweetened to me. My cast iron pan is ready for something like this. I never make anything with polenta, and it suuuuucks! I have no idea why. Totally trying this! 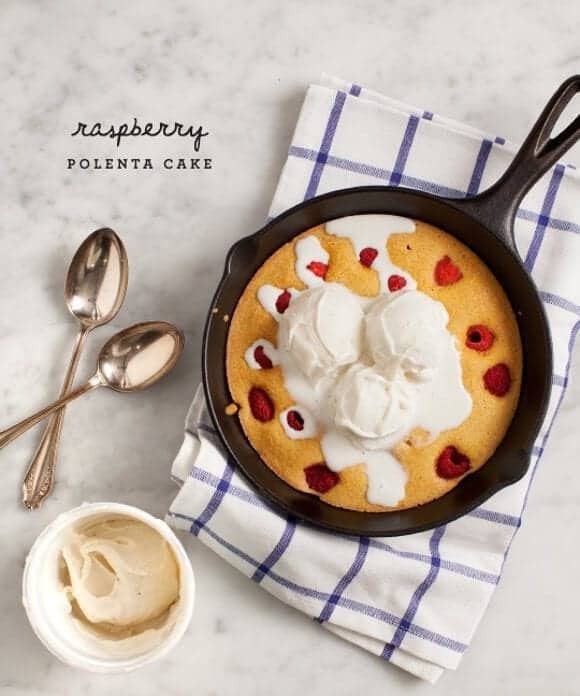 i have yet to make that polenta at home…and this cake sounds delicious esp with ice cream. 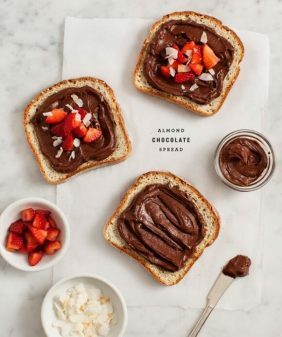 How do you get it to bake so perfectly without getting crusty, dried out or burnt at the edges? It just looks too pretty to eat! I think it baked overall a little less time than if it were in a regular cake pan… the edges were just barely more crisp than the middle, I didn’t have a problem with them burning or drying out. Girl, tell that to my oven. I’ve got a Viking oven and allegedly great bakeware, but my cakes, cookies and pies almost always come out with that telltale halo of crusty over-doneness. If I pull them before the halo develops, the middle is gooey. There must be some secret… positioning on the rack? A special lubricant on the pans? A sparing application of edible SPF 15 on all of the edges? A centuries-old voodoo chant uttered under the light of a full moon while balancing on one foot and waving a special talisman over the top of the unbaked goods? Ha – ok, well it doesn’t sound like it’s purely a cast iron skillet thing then? (if you get crispy edges w/ cookies on regular pans?). If it’s a cast iron issue, I’d say don’t preheat your pan as long so it doesn’t start out as hot. It sounds like you might want to try baking on a lower temp. Have you tried putting a detached oven thermometer in your oven to make sure the temp it’s reading is accurate? Also, I’m not sure how long you’ve had your oven but I had to “get to know mine” for a good few months when I first got it because it’s so different than the one I had previously. I have a pretty powerful Thermador gas oven/range and it runs pretty hot – at the beginning I was overcooking a lot of baked goods until I started watching it closely. After awhile I just learned to get a feel for when things are done. 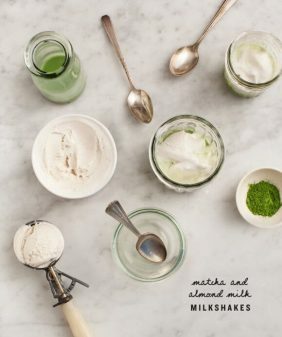 (which is always sooner than most recipes list). My last tip – try taking things out when you think they’re slightly underdone. For example, cookies continue to bake while they cool on a hot cookie sheet. What a great cake! I love raspberries, but the driver is the different texture, the size and the why you put together a recipe. Well done! Cake/cornbread baked in a skillet always looks so charming! This is perfect. Hmmm.. leftover polenta? That does not usually happen to me? Hahaha! I looooove this! I keep getting all this fresh fruit in my CSA box and I cannot find uses for all the fruit so this will come in handy as a great base! DUDE. This. Is. Happening. All of my favorite things in ONE cake (plus some vanilla coconut bliss ice cream…. ooooooh yeah)- you are my favorite person. Will report back! What temperature do you recommend baking at? Thanks! 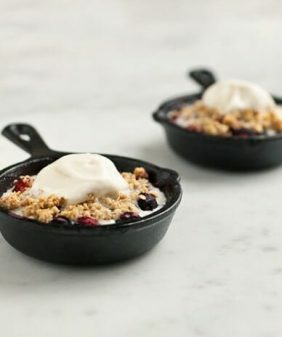 Cake in a skillet….nothing gets much better than that! I don’t make many cornmeal/polenta cakes but must start! oh this sounds like something I am going to try!!!! thank you!!!! Can you clarify if the polenta is already cooked or are you using dry finely ground polenta? I’m confused but looking forward to this recipe. The peach cake was great last year. Thanks! Yes, that makes perfect sense to me. I always think of polenta already being cooked. I’m from Maine so I’ll try wild blueberries when they’re ready! I love your bright and sunny photographs. This cake looks so delicious and hearty enough for breakfast! That cake looks so cute! And not cute in a saccharine cupcake way, but just in an appealing way. Polenta is one of my favourite things to cook with however I am yet to make a sweet dish from using it. Add this to the list! And I was looking for a vegan polenta cake recipe! This looks perfect. And I will be making it very very soon. We just made this and were joyfully surprised at (1) how RIDICULOUSLY easy it was to put together and (2) how RIDICULOUSLY delicious it is. Not too sweet, but we sifted some powdered sugar on top. We also added lemon zest to the batter which gave it some extra depth. I’m sure it will be gone by breakfast. oh I’m so glad you all enjoyed it! Made this tonight since we are in prime raspberry season. It was a hit with the family. I always make a berry “syrup” on the stovetop for pancakes with a touch of honey for pancakes and we had some left from the morning in the fridge. Perfect on top with the ice cream! Thanks for the recipe! so glad you liked it! That syrup sounds delicious! I made this cake last night and it was fabulous! We loved it so much, my husband is picking up more maple syrup tonight so we can make it again. 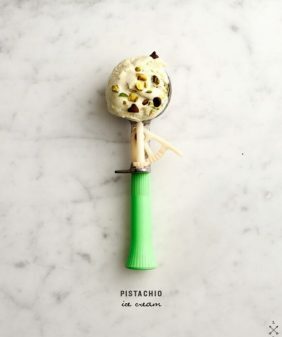 Such a unique and wonderful flavor – thank you for the recipe! Thanks so much for this recipe. It was super yummi. I made it with apple pieces on top. Made it 2 days ago and my husband had me make it again tonight! I did this yesterday, and doubled the recipe for my 12 inch iron pan. It made 8 slices. I made a lemon glaze – with lemon juice and powdered sugar, which I poured on top. It came out really nice and was actually better after it cooled and set. As i saw your recipe I immediately realized an urgent need to cook after it. My cake is now in the oven. I’m sure it’ll be delicious! Thanks for the recipe! Gosh how I LOVE polenta cakes . . . and this one came out perfect! Can’t wait o try it with peaches or blueberries or even figs. Seriously so good, so versatile and so easy. Winner! I’m so glad to hear that! Thanks Alina!